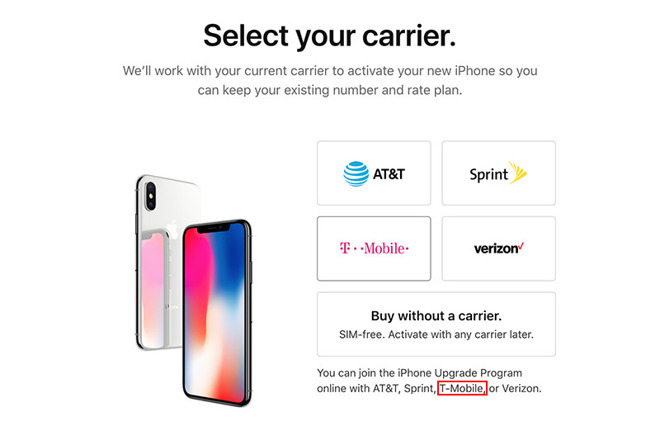 Apple this week added T-Mobile to a short list of major U.S. wireless operators that have online access to the iPhone Upgrade Program, allowing customers of the telco to sign up for the service through the online Apple store. The new T-Mobile integration was added earlier this month and noted on Tuesday by members of online community Reddit. To mark the change, Apple's online storefront and dedicated Apple Store app have been updated to read, "You can join the iPhone Upgrade Program online with AT&T, Sprint, T-Mobile or Verizon." With the option now live, T-Mobile subscribers can now enroll in the iPhone Upgrade Program directly through Apple's online storefront and the Apple Store app. Previously, customers of the wireless operator looking to join the annual upgrade program would need to sign up in person at an Apple store. Unveiled at Apple's annual iPhone event in 2015, the iPhone Upgrade Program is a first-party service that provides members access to a new iPhone every year for a set monthly fee. Apple initially required interested customers to sign up for the upgrade path in-store, but later opened enrollment to online customers in 2016. AT&T, Sprint and Verizon were part of the online store integration, while T-Mobile was left out until this week. The iPhone Upgrade Program was designed to boost slowing iPhone sales by introducing a new, affordable hardware replacement route. Last year, Apple offered a loan pre-approval process for iPhone X, granting program members an equal shot at nabbing a launch day handset. The company is expected to repeat the process this year. The iPhone X preorder process did not go smoothly for all iPhone Upgrade Program members, however, as some were nearly denied an early unit due to an apparent hiccup in the loan application process handled by Apple financial partner Citizens One. Apple instructed customers who woke up early — or stayed up late — to order iPhone X to wait for a verification notification from the bank, which in certain cases resulted in a denial letter received hours later. By that time launch day supply was long sold out. Apple ultimately rectified the issue and reinstated the original ship-by dates reserved for early preorders.